Jeff's wife here signing in to leave a quick word about Thomas Nelson's Heaven is for Real (for Kids) book. 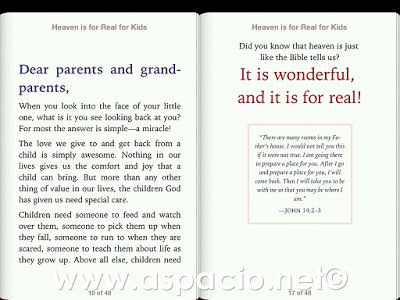 I first heard about Heaven is for Kids by Todd and Sonja Burpo from an Aunt who lives in the States. She highly recommended for us to read it. It was said to be a true story of a kid who had a glimpse of heaven when he was severely sick 4 year old child. When I saw that this was one of the books available for us to review from Thomas Nelson, I gladly grabbed a hold of it. 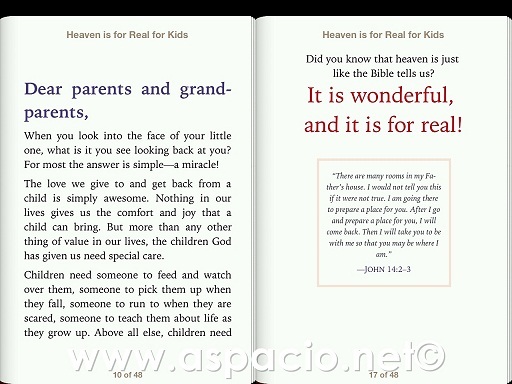 "Heaven is for Real for Kids" by Todd and Sonja Burpo is especially made for kids. Illustration was by Wilson Ong. Heaven is for real, and you are going to like it! Colton Burpo came back from his trip to heaven with a very important message: Jesus really, really loves children. In effort to reach even more families with this eternally significant story, this runaway bestseller is now told from Colton—kid to kids! Children will receive the same comfort and assurance that so many adults have received from the trade book. Beautifully illustrated, under Colton's direction, this book is uniquely written from a child for a child. Colton tells of his experiences in first person and comments on things that will be important to kids. A letter to parents is included to guide them in talking to their children about heaven. Scripture along with Q&A section with answers from the Bible are also included in the book. Since I have not read what the adult counterpart of this book, I really did not have a lot of expectations. Except that it's for kids. So to add to our 7 year old, very eager reader's collection, I requested the eBook and he read it today after his afternoon nap from our iPad. Our son loved it! But there were very serious and valid questions that came up. He asked his father and me, if it is at all true that people can see heaven and go back to earth. It's lovely that there is a portion in the book where Questions Kids Ask about Heaven is Real is dealt with and it includes an answer to that question. The answer to that question from the book is: "Yes! God has allowed some people to see into heaven briefly. The Bible says isaiah, Daniel and the apostle John were all shown parts of heaven. The apostle Paul also talks about a man who visited the "third heaven," by he gives no name." What really tugged my heart and got me to uncontrollable tears, that I almost ended up creating a floor fountain, was when Colton met his older sister in heaven. The sister she never knew he had. Apparently, his parents lost her to a miscarriage when her mother was still pregnant with her. Imagine the surprise in Colton's parents when he relayed this to his folks. The tears just welled up my eyes as the pain of the miscarriages we personally experienced six years ago came back. The hope of seeing our children (yes, we miscarried twice) in heaven gave my heart as the revelation came upon me that it needs to heal some more. I never thought that it would still be as painful now that I remember. But the tears of remembering them came with hope this time. It was not only my son who benefited from the book. It touched the very core of my heart too, an emotion I never thought that's still there. Now, I'm not saying I'm totally believing Colton's experience being true. But given that each illustrated page came with a verse supporting Colton's account and remembrance of what heaven was like, I'm good with that. The kid's claims seem to support what the Bible says. In the event if their claims are false, then they're accountable to God for that. 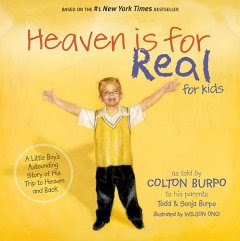 Thank you, Thomas Nelson for the privilege to own and review this New York Times bestselling book, Heaven is for Real for Kids by Todd and Sonja Burpo.